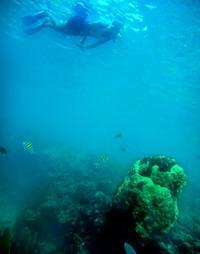 If you want an experience in the water you will love this reef snorkeling cruise. You will get to see beautiful animals up close and personal as well as interact with friendly and professional staff will help you have the time of your life. This is an exceptional activity that you will love doing and you will always remember. If you are looking for the chance of a lifetime to really get out of the city and have fun then this is your opportunity. It is the perfect opportunity for you to take a break from everything and have a wonderful time interacting and playing with family and friends. If you are looking to meet new people and relax then this is also a tremendous opportunity for you. Everything you need to enjoy this tour is included including free drinks. You will go on a large catamaran with a large deck we can soak up the sun and enjoy the Seabreeze and then cruise towards a large reef in Key West. You will be given your snorkeling equipment and also everything else you need to have the time of your life. If you are looking for beautiful translucent water then you have found the right place. You will be able to take it all in and have fun. You'll be able to see schools of fish swimming around and interact with some of the native wildlife as well. This is a tremendous opportunity for you to get open close to animals nature. You will be able to explore the reef and then climbed back on the deck of your catamaran and enjoy delicious beverages and relax. This will be the perfect way to get out in the sun. Meet your crew at Key West's historic seaport, and sail away aboard the Marquesa, a 69-foot (21 meter) catamaran with sprawling deck space for soaking up the sun and sea breeze while you cruise toward one of the most beautiful reefs in Key West. Pay close attention as professional crew members provide a safety briefing and snorkeling overview. When you reach the reef, hop into the translucent waters with provided snorkeling gear to discover an underwater world of exotic fish and neon coral. As you follow the many schools of fish around, keep your eyes peeled for copper sweepers darting to and from rocks. If you're curious to know what exactly you're seeing, ask the crew to share their expert knowledge or request a handy fish-identification card. After exploring the reef, climb back on deck and wet your whistle with provided beverages including wine, ice-cold beer and filtered water. Perhaps indulge a bit further with your favorite cocktail at the onboard cash bar, and then sit back and relax, keeping watch for a pod of dolphins who might swim along the boat. Your tour ends with return to the marina. Departure Times: 1:00 p&period;m&period; Please arrive at our office between 12:15 and 12:30 to check-in. 3.5-hour morning snorkel tour with equipment, professional instruction and beverages included. 3.5-hour afternoon snorkel tour with equipment, professional instruction and beverages included.